Focus on what matters. These frameworks help us keep the focus. Upgrade your user, not your product. Don’t build better cameras — build better photographers. Ten thousand years ago, we were hunter gatherers and used our feet to roam the earth. Today, we have fast food restaurants and autonomous cars. Why did we change? Because we have an intrinsic desire to evolve ourselves. We do this by remaking and adapting to the world around us. A bear trying to catch food by the river may think, I wish fishing could be made better, faster, or easier. But only a human will think, Fishing is no good. If I could transform that lagoon over there into a place where I can breed fish, then I’d never have to go fishing again. The bear thinks only about what is. Today, it may come up with a better, faster, or easier way to fish. But tomorrow, it is still a bear that fishes. The human, on the other hand, thinks about what ought to be. Today, she fishes, but tomorrow that can change. If she could figure out a way to no longer fish, then she can focus on improving herself in other ways — like building a hut so she could move out of that dank cave. The bear does not think about evolving itself and its world. It never has a Job to be Done. The human, on the other hand, does think about evolving herself. And every time she begins the process of evolving herself, she has a Job to be Done. 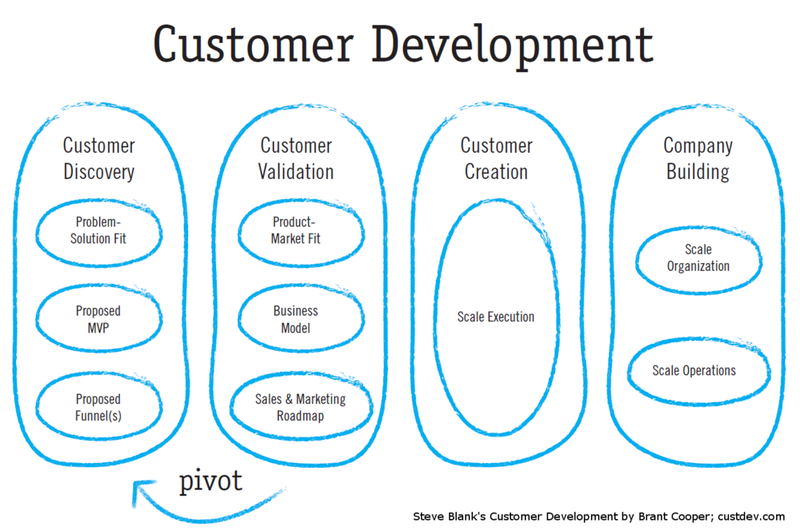 The Customer Development Model (CDM) was originally described by Steven G. Blank in his book, The Four Steps to the Epiphany. Blank, who is a lecturer in entrepreneurship at the University of Berkeley and Stanford University, based the book on his observations while working for a number of startups in the Silicon Valley area. Blank defines the Customer Development Model as “a set of objectives and milestones that are meaningful for a startup.” Blank’s model is a way of questioning the assumptions underpinning a startup by systematically testing them in the marketplace. The main objective of the CDM is to reach a deep understanding of customers and their problems. The depth of this understanding allows entrepreneurs to strengthen the focus of their product development as well as their marketing and sales activities. The practical appeal of the CDM has since formed the basis for an increasingly popular school of thought around how to start a technology business, aided by the writings of Eric Ries (The Lean Startup) and Ash Maurya (Running Lean). Ries and Maurya both attempt to integrate the CDM process with the principles of agile product development. OKR stands for Objectives and Key Results; where “O” is for objective and is what the business wants to achieve. “KR” is for the key results and is what the business needs to see in each specific time period in order to achieve the objective. CFR stands for Conversations, Feedback and Recognition. These elements, along with OKRs, are foundational to the process of Continuous Performance Management (™) — and is how each employee in your workforce can be motivated to achieve today’s goals and to develop their skills to meet tomorrow’s challenges. Continuous Performance Management replaces the universally loathed and ineffective annual performance review with a valuable, continuous process that actually works for the organization.